I am looking basically for a four cylinder, ABS, A/C, Automatic w/rear camera. I am still working and drive only to/from work w/the occasional errand on the weekend. I am only interested in the Champagne color, and I will be the only driver. Fuel economy is important as well as safety and the quality of the ride. I have some friends who own Honda Accords and they speak highly of their vehicles. Gas fuel is preferable. I have been looking at the Honda Accord for about a year, and the style really appeals to me, also have been driving a Toyota since 1995, and maybe time for a change. Is the Honda Accord a good option for me? The following are more observations than overt recommendations. Hondas and Toyotas have been traditionally the most reliable vehicles out on the road. But lately, Honda reliability has dropped somewhat. Some versions of Hondas are constructed in Mexico, and one model I drove seemed like the fit and finish wasn't quite up to par. The latest style of Honda Accord has been somewhat polarizing among the loyal brand owners. The new Camry is really quite nice - spunky, quite, plenty of seating space. The 2018 model is going to look quite a bit different than the 2017, so keep that in mind when you're thinking about how valuable your version will be. The 2018 looks very nice, so it could decrease the values of the 2017s. The Corolla IM presents well too; it's a converted version from the Scion brand which Toyota owned. Kias and Hyundais have progressed to offer a fairly robust line of vehicle options which combine to make a very good value for the money. It does seem like they might wear "faster" than the Japanese cars, though. Also, gas mileage has not always been as good as advertised. They've been sued over that recently. Last month, I rode in a hybrid Elantra and was impressed with how quiet it was - as well as fuel efficient. Not on par with other hybrids, but commendable, just the same. 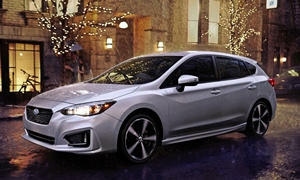 The Impreza sedan has become more refined in the last iteration. It returns very good gas mileage, and technology allows it to run in FWD most of the time, switching to AWD only when needed. My biggest complaint with Subarus has been the exterior paint quality and the lack of a solid feel in the doors. But all safety tests indicate they are some of the safest vehicles out there. Mazdas have a great sporty feel and are equally reliable. Gas mileage is great too. You might find that they're a little tight interior-wise. They're geared (sometimes) more for a sporty fit for the driver seat than space. The last one that might be of interest is the Jetta. I'm not sure if the Eos is still manufactured, but it's the same platform. The Eos is more of a two seater + 2, but has a nice retracting hardtop. 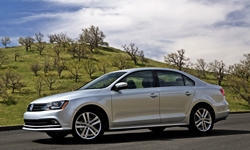 The Jetta, though, has become much more refined over time - especially in the transmission. It's nearly seamless and comes from the technology that the DSG transmission offers. Fuel mileage is very good. Nearly as good as the diesels were. They present an opportunity, price-wise, because the the market was flooded with VW diesels that were bought back from the owners (huge lawsuit over manipulating fuel emissions software). 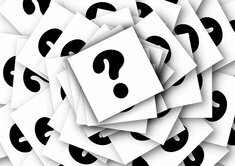 When a manufacturer has too many used cars on the market, it brings down the prices of all of the new models, which would be good for you. Still, while the 4 cylinder engine (not a 5 anymore) is reliable, I still have found Audis and VWs to have electronic problems long term. I have a blog (onefastdriver.blogspot.com) that you can take a look at if you care to. It has a review of cars that I've actually owned. I don't get paid for it nor am I sponsored by anyone. I'm on my 3rd Honda Accord so clearly, I'm a fan. I've also owned a Mazda 6 and its predecessor, the 626, and the quality on Mazdas have improved over the years (and they were good to begin with). I haven't owned a Toyota in ages but the reviews for the Camry have been much stronger in recent years after a dropoff 7 or 8 years back. The one thing I suggest about the Accord is to go for a long test drive. The biggest complaint about the current generation is the seats. A number of people have found them uncomfortable on longer drives, some especially so. I was every explicit about this with the salesman who understood. I then took an hour long test drive to see for myself. Excellent point on the seats. Too many people can't get comfortable in Hondas--something you don't want to figure out after buying the car. As someone else mentioned, there will be an all-new Camry soon. I'd wait and see how good it is before buying another midsize sedan. 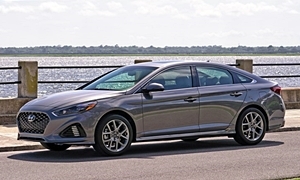 Among midsize sedans the Toyota Camry, Honda Accord, Mazda6, Hyundai Sonata, and Kia Optima are all quite good. It's often possible to find especially good deals on the Koreans. One size and price class down, the Corolla iM, Honda Civic, Mazda3, and Hyundai Elantra (2017) are all reliable cars that drive well. You might not need something as large as a Camry or Accord. Doing a quick search on cars.com I found the Accord was $18K, Camry, $17K, Malibu $14K, and Sonata $13K. Most of the are discounted $7,000-$10,000 off msrp and are basic cars with ABS. 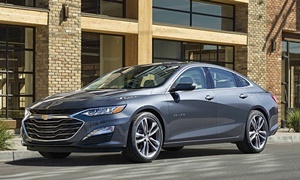 The Malibu includes back up canera, AC, ABS, and driver and passenger knee airbags. It also available in beige or silver for the best maintenence free paint colors. 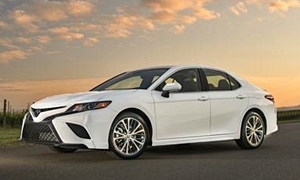 The Malibu is the news before the 2018 Camry's come and offers the most efficent 1.5t as my friend has one and is see close to 45 mpg on the highway. Which is much higher than EPA rated 37 mpg highway and right with the more expensive Malibu Hybrid's highway rating. There is allot to choose from in this dwindling segment as more people are going to cuv's that offer higher seating position and AWD.